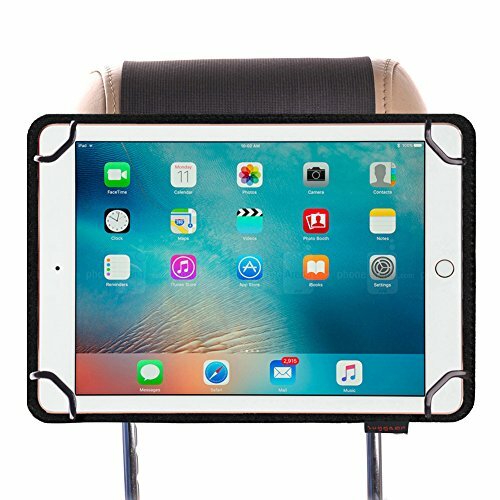 This Tablet Headrest Mount is made for the iPad, iPad 2, iPad 3, iPad 4, iPad air, Samsung S2, Samsung S3, 9.7 inch to 10 inch tablet. Perfect companion for long car journeys. Holds the ipad,Samsung tablet on the car headrest while driving. Protect your Tablet is mounted higher than other car mounts so it is safe from kicking feet and curious hands. Convenient Access to iPad slides in and out of headrest mount. Securely Mounts to Headrest Your iPad, Samsung tablet holds tightly against the headrest while seated in mount protecting it from excessive shaking and vibration due to bumpy roads. 1.Simple, easy, universal - Ipad headrest mount for car can be mounted for use on a variety of headrests including, Car seat Headrests, Truck Seat Headrests, Minivans and SUVs Seat Headrests. Its two straps can be easily attached to both sides of the headrests conveniently. Allowing you to mount your tablet on the headrest for hand-free viewing. 2.Durable - This universal Car seat Headrest mount is made from 1680D Nylon, which is super durable to withstand wears or tears within short term use. 3.Stable- Universal Headrest tablet holder has four special plastic corners which holds the tablet very well, no worry about the tablet falling while you are driving. 4. Universal- This back seat Tablet mount is suitable for Ipad Samsung 9.7-10.5inch tablets. 5.No boring on the road - Headrest car mount allows you to foucs on the driving while the kids or passengers are kept entertained in the back. If you have any questions about this product by ZugGear, contact us by completing and submitting the form below. If you are looking for a specif part number, please include it with your message.